10 Proven, Spiritual Keys To A Life of Wholistic Success! 10 Proven Keys to help you create total life success! 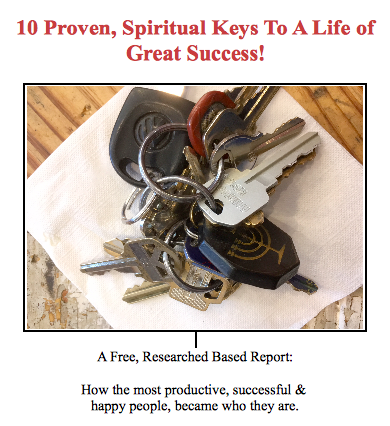 10 Keys for developing a life of wholistic success - Total, spiritual, emotional, financial, physical health & relational success! From two men who (combined) have helped thousands over the past 60 years! Success Begins with 1 click, right here. Just click either Blue Button on this page. Discover what Top Performers do! Enter your email and get INSTANT access to your Free, 10 Keys Report. Prove it to yourself, beginning today. Discover what you can do immediately to improve your Life Success!